Our patient is a 41-year-old female who came with complaint of skin folds and fat deposits of her arms. Dr. Temmen proceeded by performing a brachioplasty. The patient is very excited with her post-surgical results. 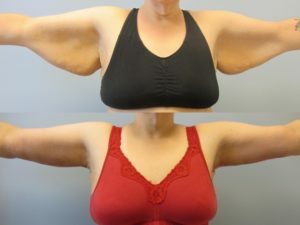 Our patient is a 38-year-old woman who was unhappy with the excess skin hanging from her arms and decided to go through with a brachioplasty after consulting Dr. Temmen. Dr. Temmen skillfully removed excess skin and fat before closing the areas in such a way that does not show scarring from both the front and the back. The patient is very happy with her results!